Birthdays are pretty big in our family. We usually always get together for dinner and (of course) cake! My mother's and sister's birthdays just passed recently and I thought I would feature their cakes in this post. Family birthday cakes are always fun to make. You get to design something for someone you know well and love. You also get to show some of your affection and love for them in cake. Birthday cakes come in all shapes and sizes. These are just two very basic cakes but you can go as far as your imagination will take you. For my mother's cake, she wanted chocolate cake with vanilla buttercream. We were having her cake the same night as the suitcase cake was made. Of course that was vanilla cake with chocolate buttercream so I couldn't use leftovers from one on the other or just double the batches. My mother likes anything I make, but I wanted to do something special and pretty. I got the idea from this cake from a Wilton idea book. I filled and crumb coated the cake with the plan vanilla buttercream. I then colored the remainder of the vanilla buttercream with a light purple and dark purple food coloring. The cake is coated with the light purple. The flowers are drop flowers and were piped with two different sizes of star tips and drop flower tips. The middles of the flowers, the writing and bottom border is done in the darker color. I did the writing and bottom boarder first so I knew where I could place the flowers. This is a 9 inch round chocolate cake. It was a bit too large for our small dinner party. I should have done a 6 inch cake and it would have fed everyone with minimal leftovers. This cake was enough for each of the 6 people to have one slice after dinner and take one home for the next day. Another trick I learned was when making a chocolate cake dust the pan with cocoa powder instead of flour. It prevents a flour flavor and gives you a more chocolate flavor. My mother loved the cake and the leftovers. It was a great way to celebrate her birthday. 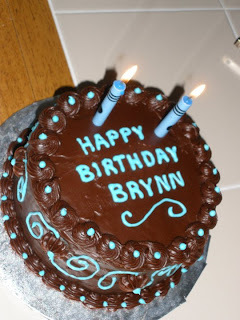 For my sister Brynn's birthday, she went back and forth on what kind of cake she wanted. We agreed that banana cake would be perfect. I thought that a chocolate buttercream would taste a bit strange with the banana cake and a fudge frosting would be better. I learned my lesson from my mother's cake and made this a 6 inch round. It was the perfect size for our small party. The frosting on this cake is very rich and usually good with a glass of milk. I tried to decorate this cake with royal icing balloons along the edges, but they just looked funny. I didn't like it at all. I scraped them off and put fudge icing flowers on the spots. I decorated the edges with two different star tips with the fudge frosting. I then used the light blue royal icing to write on the top of the cake and add accents. 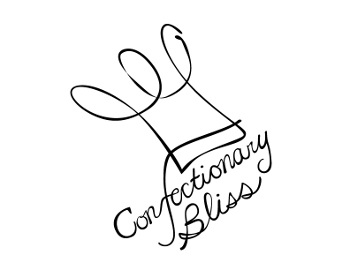 This time I made the royal icing with meringue powder, water and confectionary sugar. It does prevent you from using raw egg whites but I think it also gives a much sweeter and a bit of a tangy taste. I prefer the egg whites and confectionary sugar version to this one. Since there was a minimal amount of the royal icing on this cake it didn't really effect the flavor of the cake at all, but I think it would effect the flavor if used in a greater amount. My sister loved the cake. 1) There is no need to make more cake then needed for a small party. 2) Family will love anything you make so don't stress too much. Sugar cookies are my favorite cookies. Not only are they tasty but they can be made for any occasion. I make them every year for Christmas. This year I also made them for Hanukkah. I also made sugar cookies shaped as wedding cakes and decorated in our wedding colors as favors in the hotel bags for our wedding. I have spent years trying to find the perfect sugar cookie recipe. I have tried recipes using different types of flour, sugar and other ingredients. It may not be perfect but this is my favorite so far.